Investing Series: How to look for and choose an index fund to invest your money in | Save. Spend. Splurge. It is no secret that I think everyone should pretty much invest their money in index funds (either as mutual funds or as ETFs) and be done with it. If you want to play around and have fun on the stock market, then invest in individual stocks. If you want to build an income stream after you have established a solid understanding of investing in index funds, then take a look at dividend income investing. I’ve written plenty on the subject of index funds here in my Investing Series, but the few questions I may have missed may have been the most obvious (to me), so it didn’t dawn on me to even talk about them until this morning. HOW DO YOU CHOOSE AND LOOK FOR AN INDEX FUND TO INVEST YOUR MONEY IN? Look for the one with the lowest Management Expense Ratio (MER). As I am Canadian, my favourite examples to trot out are those e-series mutual funds offered by TD Canada Trust, or Vanguard Canada’s ETFs which you can buy using my favourite brokerage in Canada: Questrade. For my Americans out there, this applies to you too, but you should look at your local bank or brokerage (Schwab for instance, even TD Bank) and Vanguard instead of Vanguard Canada. Same goes for iShares. Instead of iShares Canada, look at iShares. Click on ANY image below to biggify. HOW CAN YOU TELL WHICH MUTUAL FUND IS AN INDEX FUND? It will generally say it in the name, but other times it may not be as obvious. Index Funds, if you aren’t already aware, are funds that track the index or average of the stock market. Read: What is an index fund? 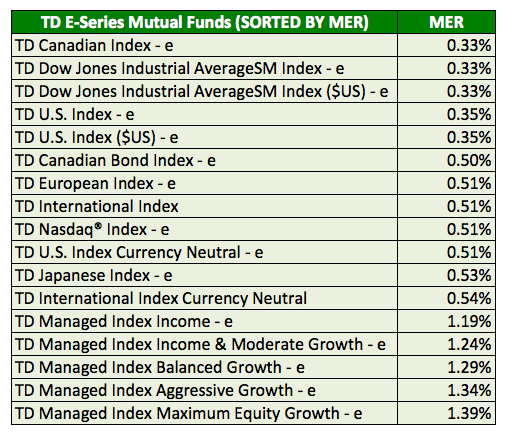 For instance, with TD Canada Trust E-Series Funds… they are ALL index funds.. see? 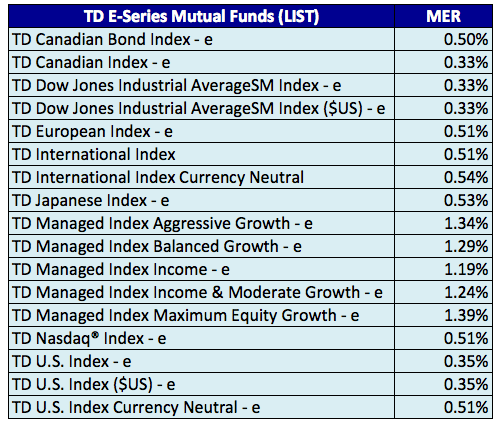 Here’s the original list of TD Canada Trust E-Series Mutual Funds. NOW HOW DO YOU CHOOSE WHICH INDEX MUTUAL FUNDS TO BUY? As I said before, look for the LOWEST Management Expense Ratio (MER), or “fees”. And because you (like me) can’t mentally sort through the index funds on the fly, I also sorted them to show the LOWEST MERs. You will notice that I have international index funds in there but that’s because I wanted to be diversified into international stocks as well and not just concentrate on Canada, the U.S. and Bonds. You’ll notice I pretty much cut it off around the 0.51% MER mark. Frankly, it covers all you need to have a diversified portfolio. Read: What is a diversified portfolio / What does rebalancing a portfolio mean? *You do NOT need to open another account with TD Waterhouse to buy TD Canada Trust E-Series funds. **Currency-neutral means it takes into account currency exchange fluctuations and takes into account the risk of that currency losing its value (also known as the practice of “hedging”). Generally speaking, the NON-Currency Neutral Mutual Funds are more volatile, and currency-neutral are less volatile. ***When it says ($US) like that, it means it’s held in U.S. dollars. Again, the fund hinges on how the USD fares. Read: How to invest with TD Canada Trust E-Series Mutual Funds. These are FAR cheaper than the cheapest index fund offered by TD Canada Trust E-Series. The lowest at TD Canada Trust is 0.33% as an MER. The lowest at Vanguard Canada? 0.09%. 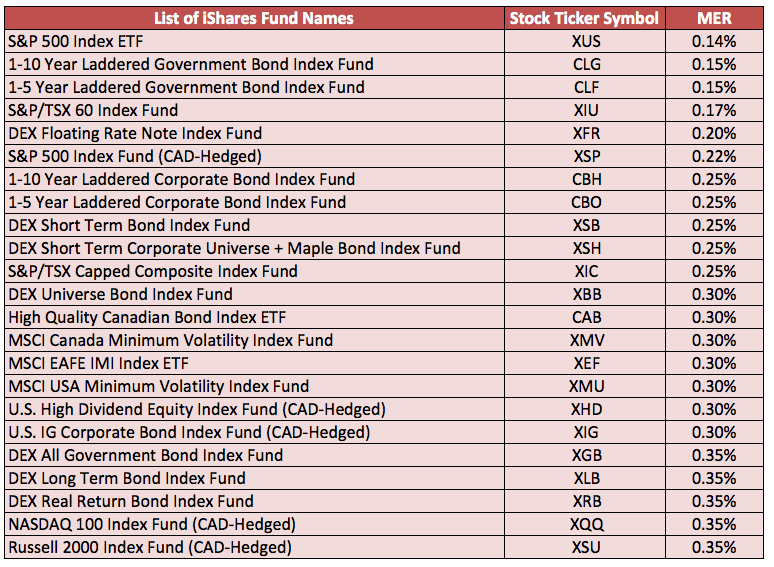 HOW CAN YOU TELL WHICH ETF IS AN INDEX ETF / FUND? Again, it says the word Index, it means it’s an index ETF. They’re pretty much all Index ETFs. As you can see, even if you buy the most expensive REIT Index ETF it is about the price of the most basic index mutual fund offered by TD Canada Trust. (THIS is why I love ETFs). This is current as of December 17th 2013. They are constantly adding new funds, so you can’t go totally by this list. 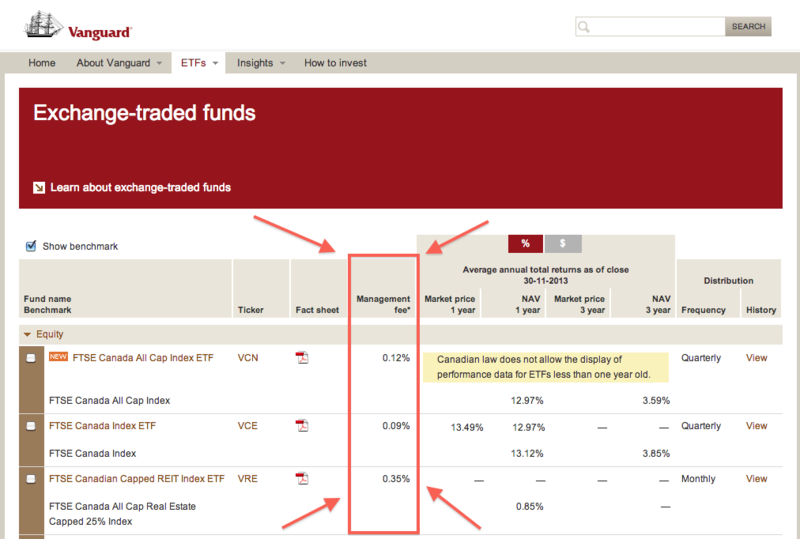 Go check out Vanguard Canada’s ETFs, and consider using the cheapest brokerage I have come across (Questrade) to buy them.. COMMISSION-FREE. Yep. No $4.95 – $9.95 per trade fee. All ETFs on Questrade are COMMISSION-FREE. I do not bother with CAD-Hedged ETFs. I just don’t, even though the MERs cost the same. Currently, they do not offer European or International index ETFs, so I go to iShares Canada for that. This is a BIG.. BIG.. list. ..and then you also have industries of each index fund such as Real Estate or Utilities. For MER’s, I’d stop around 0.30% – 0.35%….which would also cover any international index funds (read: EAFE). Any higher and you might as well buy from TD Canada Trust’s E-Series. Personally I’d just stick to Vanguard Canada for your major markets (Canada, U.S.A., Bonds), and go to iShares Canada for index funds that cover international and emerging markets. ..at least until Vanguard Canada comes up with their list. Again, in Canada to buy index fund ETFs you need to go with a brokerage like Questrade. ← How do you go about getting an obstetrician or OB in Toronto Ontario Canada? Do what you think is best. I am just suggesting a general approach, and if people are interested, they can research into it further. Thanks for this post! Just in the nick of time! I just wrote a post about how I’m paying super high MERS without having realized it and am going to switch to TD investments. Do you invest in USD to reduce currency exchange risk? How do you do this? I understand that it’s more optimal than buying all shares in Canadian, but not quite sure how you would perform these transactions. Do you just switch CAD to USD and then invest the USD? Make sure you go with TD Canada Trust, sign up for their mutual funds and then ask for their e-series. Here’s the process on how to sign up for TD Canada Trust E-Series Funds. I did not invest in USD to hedge any kind of currency risk. It was just a fluke that I moved to the U.S. in 2012, came back with over $100,000 in USD and never switched it to CAD because I was not excited by the exchange rate. I just started investing in USD (I put the money into Questrade), bought US stocks and never exchanged it…. 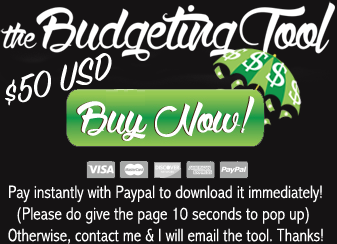 If you do not already have USD then you need to take your CAD, convert it into USD and then invest in it. I have a USD chequing account with TD Canada Trust, the one that only gives you 5 free transactions a month and makes you pay fees for certain things. Now I just transfer the USD money directly from that US dollar chequing account in TD Canada Trust to Questrade (I use Bill Pay for this) where I hold 99% of my portfolio because I buy index fund ETFS which are cheaper (Vanguard, iShares) and not those e-series index fund mutual funds from TD Canada Trust), and trade on Questrade. P.S. The CAD is really low right now. I wouldn’t convert anything from CAD to USD at the moment. 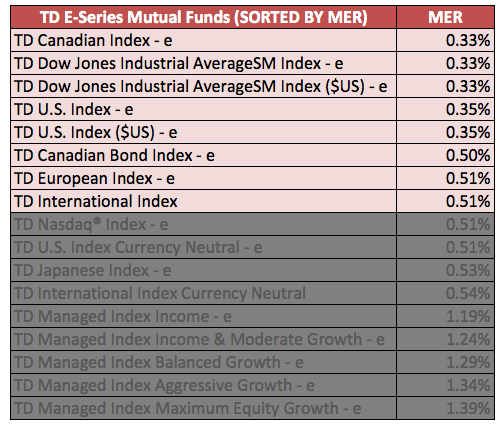 Just buy those TD Canada Trust e-series index funds in CAD$ rather than USD$. Thanks for your advice! I opened an account with TD today and will purchase some index funds once I get my $$$ transferred over. I was thinking of investing 30% of my financial assets into TD Canadian Index Fund – e-series, 20% into Canadian Bond Index Fund – e-series, 25% into U.S. Index Fund – e-series, and 25% in Global Index Fund – e-series. What do you think of this asset allocation? This is the first time I’m going to be actively keeping my portfolio balanced .. kind of nervous! Well if they don’t bloody recommend that you buy TD E-series then why the hell do they sell / offer it? The younger you are, the more you should have on the stock market, so I’d personally recommend that you lower your bond allocation. Of course take all the above advice with a grain of salt, I’m not a financial advisor nor do I play one on TV but this is how I’ve allocated my money (more in stocks, less in bonds). @save. spend. splurge. : I thought my bond allocation was a bit high too! But I followed the model portfolio on canadiancouchpotatoe -> http://canadiancouchpotato.com/model-portfolios/ and they have 40%!!!! Someone in the comments said you should have as much in bonds as your age, and I’m 23. I will lower it to 15% as per your recommendation! 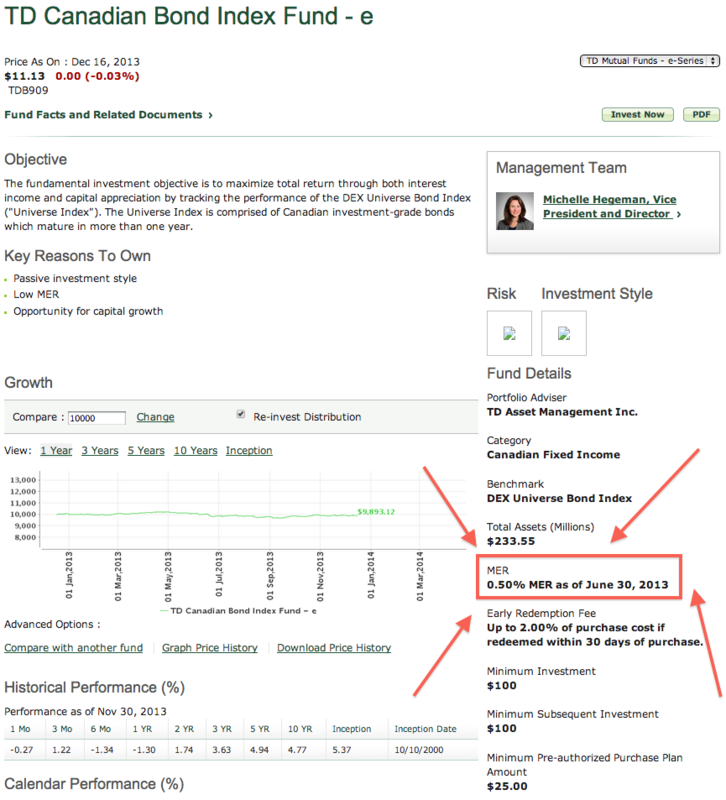 Also … TD e-series requires you to convert your existing TD mutual fund account to an e-Series fund account. They sure make it difficult to purchase these little fellas. Did you ever write a post on how to re-balance your portfolio and how often you should do it? I’d like to learn how! Does “Set it and forget it” work when you’re buying index funds? For example, what if U.S. does super good and all of a sudden the value rises to say 50% of your portfolio instead of the 30% you wanted. Should you then transfer some funds over to Canadian or a struggling index? Thank you for your helpful advice as always Mochimac. @Tracy: See below for answer. (Had to start a new thread). 1. 15% is what I am currently doing and I am almost a decade older than you.. mostly because there was a nasty recession before and things are on the mend.